die, He helps us to die a holy death. But if it is better for us to get well, then He makes us better. The Church exhorts the Christian who is ill to unite with the Passion and Death of Christ. (Catechism of the Catholic Church 1994 Reference 1511, 1499, 1513). 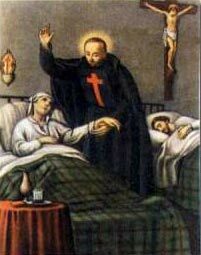 The Sacrament of the Sick my be received by any Catholic who is facing a serious illness or is of advanced years. to arrange an appointment with a priest . The Deacon and other volunteers are willing to visit those who are in the hospital, nursing home or confined to their own home. Just let us know. Please notify the parish office whenever someone enters the hospital or desires a pastoral visit. Hospitals no longer call to let us know.